This child safety gate for toddlers was installed in a play room area to prevent access to the top and bottom of this staircase. The baby stairway gate was installed with a “No Holes” clamping system on the banister post which eliminated any holes. 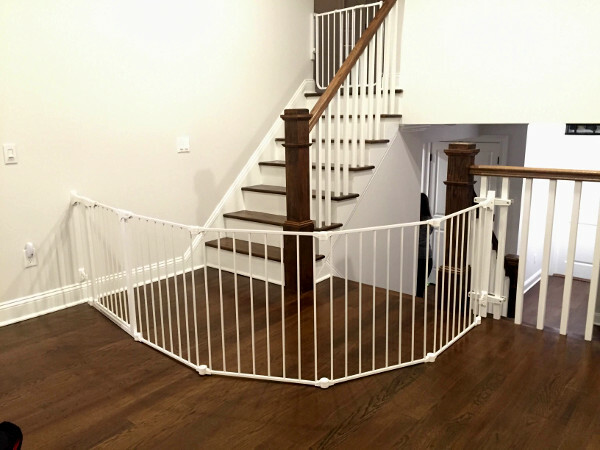 The custom configuration of the toddler gate allows adults to pass through this level of the home without the need of gong through any baby gates. This large sectional child safety gate has an easy open door with a self locking and hold open feature. It can easily be removed for cleaning and entertaining. If you need help with a child safety gate for the top or bottom of your staircase or anywhere else in your home, please contact your local Baby Safe Homes safety professional. We would be happy to assist you with your childproofing needs. Safety is just a phone call away. Make sure all alcohol is out of reach of children. It is extremely toxic! NEVER line trash cans with plastic trash bags due to the choking and suffocation hazard it poses. Water temperature should be adjusted to 125-130 degrees or less to help prevent scalding. Thank you very much for making my house a safer place for my twin girls. You did a wonderful job! Everything works great, and I’m starting to appreciate all the devices even more as the girls get better at getting into things. I will certainly recommend Baby Safe Homes to all of my friends with kids and my patients. Thank you for helping us babyproof our new home. I loved that you gave us all the options and didn’t push anything on us and allowed us to pick what we felt was necessary. Also, I couldn’t believe how quick everything was finished. Within a few days of speaking with you, you came out and installed everything in just 2 hours! Our stair gates look and work great! I wish I had heard of you before and I will definitely recommend you to all of my family and friends. Thanks again. Hi all. I just wanted to let you know that we recently used Baby Safe Homes to childproof our house. More than a few friends referred us to this company and I can’t speak highly enough it. They came to our house for a consultation, made recommendations, and did immediate installation. He was very honest and didn’t pressure us to buy or install anything we didn’t feel we needed to. If you have an infant ready to crawl (as we do) I’d highly recommend Baby Safe Homes. Baby Safe Homes was an absolute pleasure to work with. I felt so overwhelmed by the process of babyproofing I procrastinated until my 8 month old was on the go. Within a few short days of my initial call Baby Safe Homes came out, gave me the guidance I needed, and proofed my entire house with top of the line products all within a 2 1/2 hour period. I can actually get more done now without constantly stopping to chase my son! Many people put-off baby proofing because they do not have the time- there is absolutely no excuse for that. I have taken care of patients who have their babies fall down stairs, choke on door stoppers, and pull down furniture onto themselves. This can be prevented. And the service is very affordable- the only additional cost versus doing it yopurself is the labor cost.Thank you to Baby Safe Homes for providing an excellent service to me and my patients.